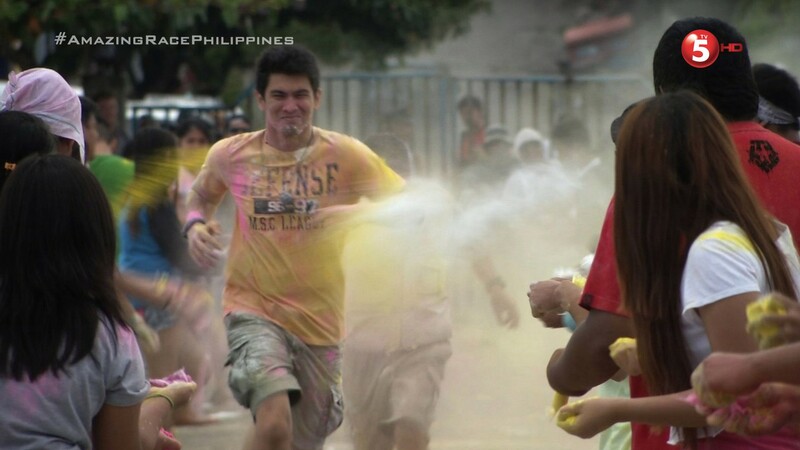 Recap: The Amazing Race Philippines 2, Episode 37 (Leg 7, Day 1) – "Hindi masaya batuhin ka!" It’s time for the 7th Leg of the Race. AJ & Jody expect them to be a target now that they’ve officially won a Leg (plus one). At 3:50am, they open the first clue and it tells teams to take a ferry to Tagbilaran, Bohol. Once in Bohol, they must make their way to K of C Drive where locals are waiting to greet them with a local fiesta game. They have P4870 for this Leg. They get to the terminal at Pier 4 just as it opens and they find the first ferry leaves at 8:45am. Kelvin & JP leave the Pit Stop at 6am, Jet & Yna leave at 6:02am and Matt & Phoebe leave at 6:04am. 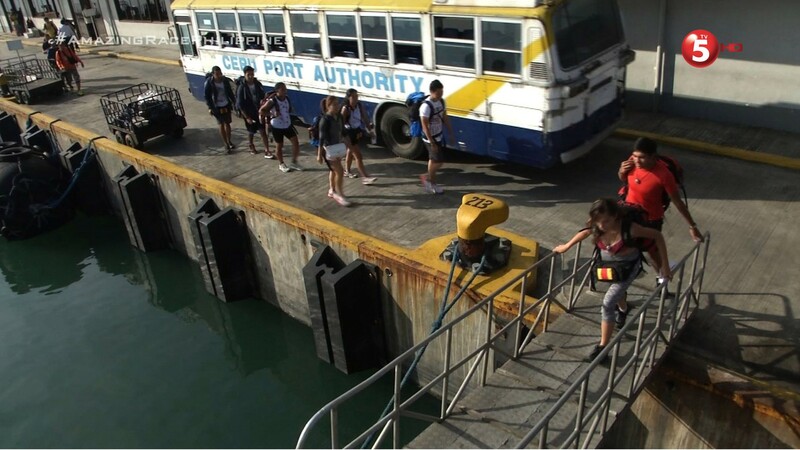 Kelvin & JP, Jet & Yna and Matt & Phoebe try looking for the first ferry out of Cebu at the OceanJet terminal, Pier 1. They settle on an 8am ferry. Roch & Eji leave the Pit Stop at 6:21am while Vince & Ed depart at 6:25am. Roch & Eji depend on their taxi driver to take them to the right terminal and he drops them off at 2GO where they buy tickets for an 8:45am ferry. 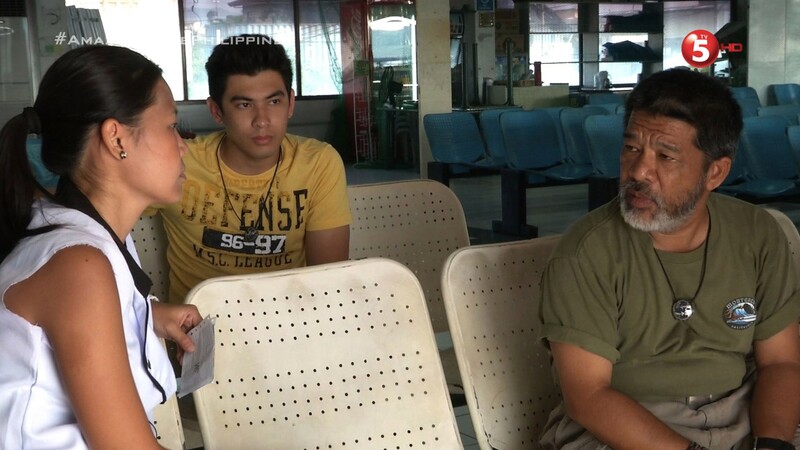 Vince & Ed are dropped off at another terminal where they ask the locals who tell them they have to take a ferry to get to the Tagbilaran ferry. Roch & Eji get inside the waiting area where they see AJ & Jody. They are surprised why it’s only the four of them there. Jet & Yna are talking to Tita passenger who says she heard another team was going to buy tickets here but went to another ferry instead. 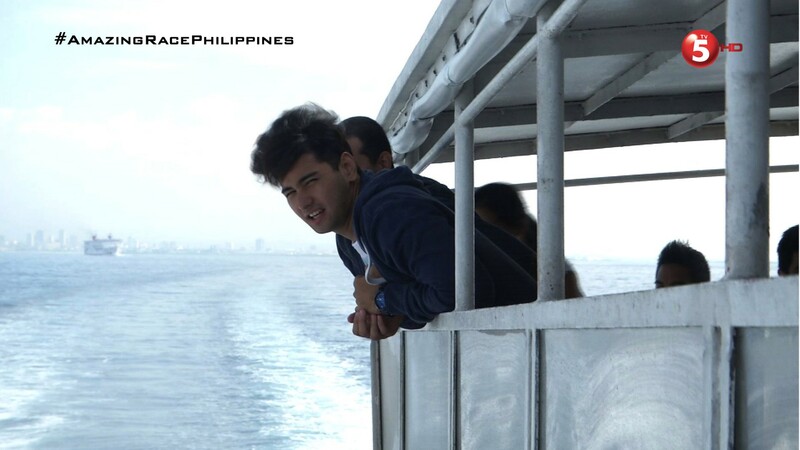 Worried, Roch & Eji ask and find there is a ferry at 8am, but they need to go to that terminal to confirm their tickets. Both them and AJ & Jody hurry over. Vince & Ed try to tell the ferry captain to hurry it up because they are in a contest. The middle three teams are happy and excited, hoping AJ & Jody are on a different ferry and get a penalty. But AJ & Jody and Roch & Eji arrive at the ticket booths. AJ & Jody had checked here earlier and the Kuya guard told them the ferry left at 9am. They head inside and reunite with their friends. As the five teams board the 8am ferry, Vince & Ed have just disembarked from theirs. They are told there’s a 9am ferry, but they want 8am. The five teams are excited Vince & Ed are not there yet. And they happily celebrate when the ferry finally departs. The Nerds have to settle for the 8:45am 2GO ferry. Once teams arrive in Tagbilaran, they will hop into a taxi which they will use for the duration of this Leg. Jet & Yna, Kelvin & JP, AJ & Jody and Roch & Eji find taxis while Matt & Phoebe hop into a tricycle. They realize their mistake and ask to get out to find a cab. There are numbers at the flagged gate. Kelvin & JP take #1 while Jet & Yna are 2nd. Before moving on, teams must vote. Kelvin & JP and Jet & Yna vote AJ & Jody. Jet hesitates because AJ is old, but they reason that age means nothing in the Race. Especially since AJ has beaten Yna in past challenges. Roch & Eji just beat AJ & Jody to the numbers. The Chefs vote AJ & Jody and the Magama vote Roch & Eji. Now it’s time for teams to grab their next clue. But to do that, teams must run through locals throwing colored powder at them. Kelvin & JP run through the welcome and they open the clue revealing the Road Block. Jet & Yna run next. They have fun. Matt & Phoebe arrive and they vote AJ & Jody. Meanwhile, Vince & Ed are just arriving in Tagbilaran. They find there are only 30 taxis in Bohol, so they must run to find one. Roch & Eji run through next. They realize every time they wear their chef outfit, they get dirty. AJ & Jody are next and they find it actually hurts in the face. Vince & Ed are still in last and agree to P3000 for their taxi all day. They vote for Roch & Eji before getting their turn through the powder run. But Vince is very annoyed that the people are enjoying making them itch with powder. This was an okay episode. Since we didn’t really get any airport drama going to Cebu, the ferry drama here may be the closest we’ll get to such fun. It might have gone on a little longer than it should though. But I can’t disagree with the decision to feature it since they couldn’t possibly fit the Road Block into this episode either. This episode kinda showed why it’s not always the best format since we know Vince & Ed did not catch up to the others. It’s not like it took the other teams 45 minutes to run through the powder. But it was funny though seeing teams sad and guilty Vince & Ed didn’t make the early ferry. No! Don’t be sad your competition is 45 minutes behind you. They’re your competition, dude. Be happy that you’ve got an advantage, especially on these long Legs. As for the powder, it was amusing to see. 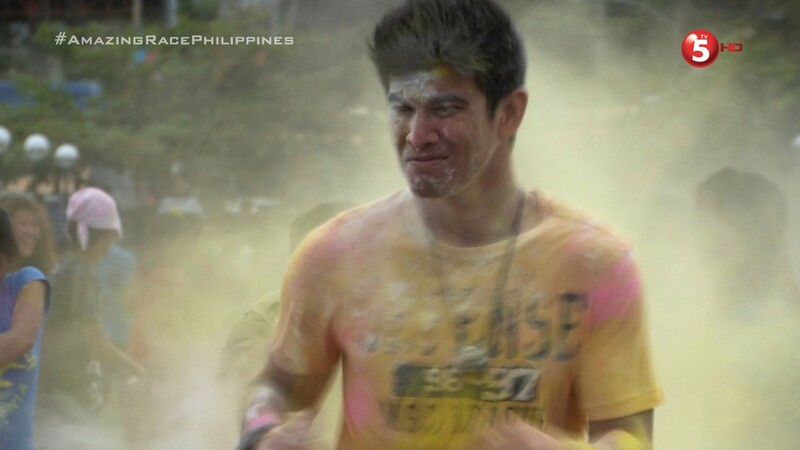 Though I wish TARPh saved the task for when they go to India next season and experience the real Holi festival of colors. (lol) There must be a Holi Road Block when TARPh goes to India! This episode made me wish RR & Jeck were still in the Race though. How would they have reacted to this likely “abnormal” task? Hehe.